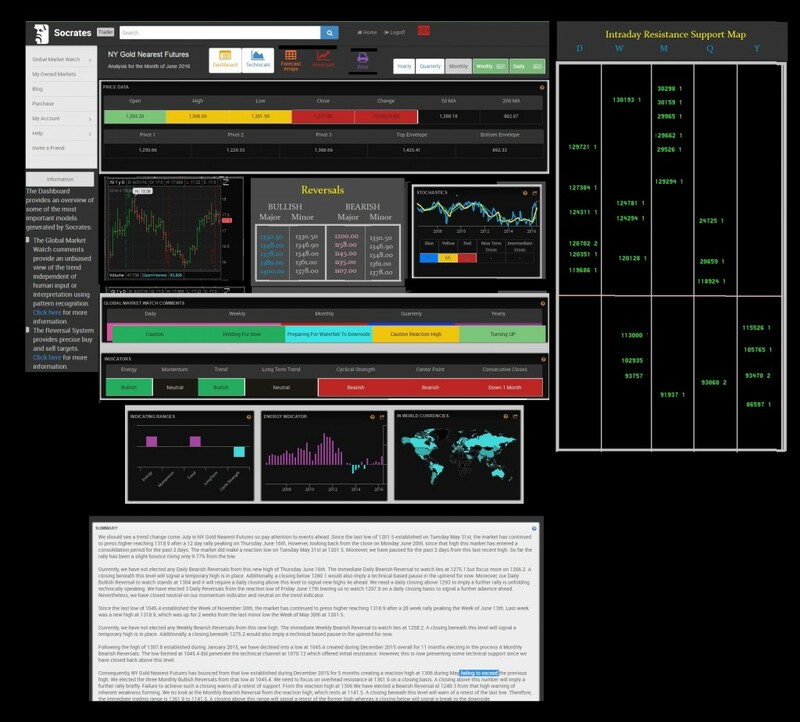 Here is a mock-up of the Trader version we will release to attendees of 2015 and 2016 WEC for a 30-day trial. The final round of reports for the 2015 WEC attendees will be sent out shortly. We plan to release a report on asset allocation and a report on the pension crisis. Our reports have been delayed due to programming and the reaction rally we were expecting (e.g. the euro moving back to 11600). Many attendees have written to us to say they appreciate having access to the first preview of Socrates, and that the delay in the reports has actually extended their current value. Nevertheless, this has been only a preview of version 1.0. We are incorporating much more for the Trader version. Our goal is to provide a global platform that is integrated. Using the same system around the world provides familiarity when looking at the arrays and prices in any market to provide that instant perspective. The trader version will have a map to the right where the resistance and support will be found to show the gaps. This is a unique system that I use personally in day trading. Here you can see the points where there is resistance (green) and support (red). At first glance, you will notice every tick is often highlighted, but look at the column to the right. There you will see the number of hits that fall on that number for the day. This allows you to see the gaps that are technically driven by time separate and apart from the Reversal System. 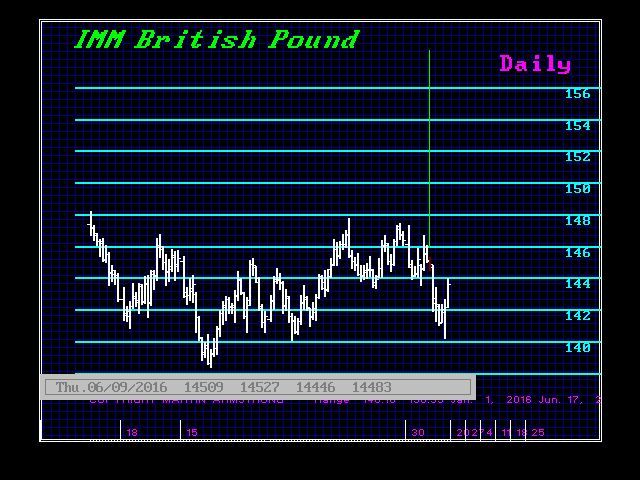 This is the daily matrix for June 9, 2016, in the British pound futures. The range that day was 14527 to 14446. Looking at this matrix you can see we have a strong cluster of support from 14449 to 14439. On the upside, the cluster of resistance begins at 14547 while the high that day was 14527. Overlaying the Bearish Reversals, the day before the pound closed below two Daily Bearish Reversals at 14560 and 14590 closing at 14504. The next Bearish Reversal was 14465 and then the next day, June 10th, opened below that number. The cluster of support for that day extended down to 14404. The next Daily Bearish was 14375 with a gap down to 14270 followed by another gap down to 14120 and finally 14090. Combining this Matrix with the Reversals, we can see how and where panics unfold. June 10th opened at 14466, reached a high of 14481, and then turned south to drop sharply to 14187 closing at 142.69. June 10th elected 14465. 14375, and closed 1 tick below 14270. This left 14120 and 14090 below the market. The Weekly Bearish was 14415, which was elected on the Friday closing at 14269. On Monday, June 13, the pound fell further stopping at 14124 to close at 14233 holding both of these Daily Bearish. The next day, June 14th, the market fell to 14099 closing at 14112 electing the next Daily Bearish of 14124. Finally, the low came two days latter on June 16th dropping to 14021 and closed at 14216. The Weekly Bearish were 14005, 14055, and 14150. All three held at that time. Defining the gaps helps us see where the big moves come into play. This is a review of just the Daily level. The same system is provided for the Weekly, Monthly, Quarterly, and Yearly. We are striving to provide a quality service that is impartial, entirely computer driven, and in that sense, independent of human opinion and emotions. This is the only way we can move forward to become STUDENTS of the market rather than complaining and looking for the next guru.